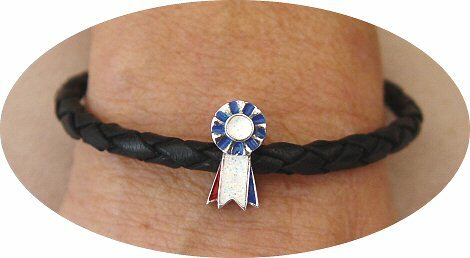 A Sterling Silver Red, White & Blue enamelled Champions Rosette bead on a black, braided, real leather bracelet. The Rosette bead is 3D (same on both sides), is stamped 925 and the white enamelling contains metallic flakes for extra sparkle. 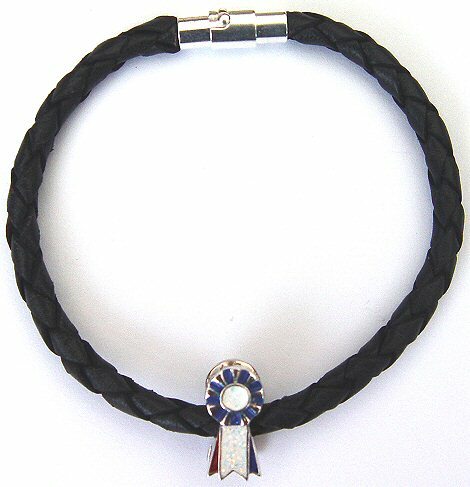 The black leather bracelet is finished with a silver plated magnetic fastening with a bayonet (twist) lock for added security. The Rosette bead is approximately 1.5cm tall and 8mm wide and the bracelet is available in a range of sizes to suit all. If the size you want is not in the drop down list please select Custom Size and then add a note to your PayPal order, or email us, with the size you want. 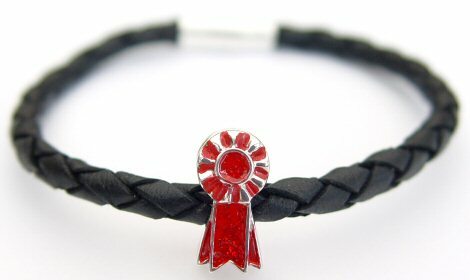 Winners Rosette Bracelet: Sterling Silver Red Winners Rosette bead on a black, braided, real leather bracelet. 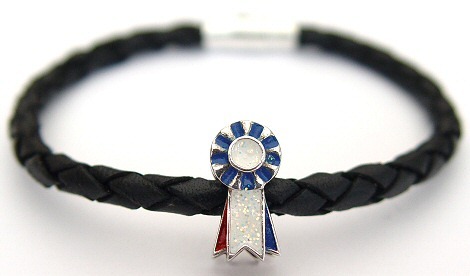 Short Description:- Champions Rosette Bracelet: Sterling Silver Red, White & Blue Champions Rosette bead on a black, braided, real leather bracelet.